Oven-Fried Panko Crusted Chicken Drumsticks are coated with an extra crunchy seasoned panko crust and then baked in the oven until they are golden brown and extra juicy. No one will believe that they're baked and not fried in oil! I love to cook chicken drumsticks for my family. They are usually super inexpensive and can be bought in a big pack that's enough for several meals. I'm also a fan of them because one drumstick is the perfect portion for the kids. The way that we usually prepare them is on the grill, like these Honey Mustard Drumsticks, but I decided to bake them in the oven this time with a crispy crunchy panko coating. The result leaves the chicken so incredibly juicy and super crunchy, just like chicken that's been fried. Hence the name "oven-fried". I think what surprised me the most about this chicken was how much my 5-year old loved it. Her exact words were, "Can we have this for dinner every night? This is delicious!" And then she continued to swoon over it for the entire duration of the meal. If that doesn't make a momma happy, I don't know what does! So, if you're looking for a way to dress up your budget-friendly drumsticks, give this preparation method a shot. I think your family will love every perfectly-seasoned, juicy, crunchy bite! I know mine did! 1. Preheat your oven to 425 degrees F. Put the butter in your cast iron skillet and place it in the oven to melt. 2. Meanwhile, in a shallow dish whisk together the egg and the water. In another shallow dish, combine the breadcrumbs, parmesan, salt, paprika, garlic powder, onion powder, oregano, basil and black pepper. 3. Dip the drumsticks in the egg mixture followed by the breadcrumb mixture, pressing the coating firmly onto each piece. Put the drumsticks into the pan of melted butter and drizzle them with olive oil. 4. Bake the chicken for 30 minutes, flip then continue to bake for an additional 15 minutes. I didn't measure the olive oil. I just gave a light drizzle to each piece of chicken. If you're looking for a slimmed down version of an oven-fried chicken, try my greek yogurt marinated, whole wheat coated Skinny Crispy Oven-Fried Chicken! It's a winner, too! Best chicken I have ever made!!!! Wow, thanks! Glad you loved it as much as we did! I have made this in a glass baking dish and it was great! When making it in a glass baking dish do you still bake it at the same temp? Yes, the baking temperature would be the same. So you get them crispy first, then bake them? How long does it go on the skillet? They are not browned in the skillet before baking. After they are coated with the panko you put them into the skillet and put the skillet directly into the oven. Bake for 30 minutes, flip the chicken over, and then bake for 15 more minutes. Looks and sounds amazing! Did you remove the skin? Thanks for your comment! I do not remove the skin. What sides did you serve this with? Oh my goodness! Made this last night and it was SO GOOD! Next time doubling or tripling the recipe for lots of leftovers. The crunch and flavor of the panko... yummy. Thank you for sharing it! You're so welcome! So glad you loved it. Creative way to make fried chicken, way to think outside of the box. You could use other cuts of chicken. Depending on what cut you use, you may have to adjust the cook time. Use a meat thermometer to ensure doneness. I did it with chicken breasts this evening and it worked just fine. Less time tho, since they were boneless and without skin. Tasted good. Great to hear you enjoyed this recipe with chicken breasts. We use boneless skinless breasts a lot in our house. Hi mine came out all wrong. Top was nice and crunchy, but when i flipped over bottom breadcrumb came off and was soggy. Then when done, bottom side was now soggy too. Don't know if baking in stainless steel versus cast iron caused it. Plus I doubled portion so drumsticks all touched had no room between. Maybe this contributed? Oh, yes. If the pan was crowded that would definitely be the explanation. I have never done it in stainless steel though. Only glass and cast iron. This sounds delish! Can't wait to make it tonight, I know my husband will love it! If i used seasoned panko breadcrumbs would that mean I can eliminate most of the dried seasonings. great recipe! My kids loved it!!!! If I don't have olive oil, can I skip that step? You could. Or you could use a little melted butter! In the oven right now! Smells amazing! Wonderful! I hope you enjoyed them! I have all gradients except for.panko. I used regular breadcrumbs. It's in the oven now....will it work? Loved the chicken legs. So, so good. Instead of olive oil I used some Pam. Worked great. Thank you for this recipe. I omitted the pepper and the basil, and put in 1/2 tsp lemon herb seasoning. Quite delicious! And crunchier than I expected!! Yes! The crunch is great with this recipe. So glad you liked them! I second that 'emotion.' There is nothing wrong with healthy chicken recipes. Chicken is one of my favorite things to eat. Sometimes we have chicken so many times in a row, week after week that my wife will complain that she is tired of eating chicken. I don't see how that can be, but that's alright; to each their own. Yes, grated parmesan is perfect. I use plain unseasoned panko. I'm planning on using chicken thighs. Should I start cooking them with the skin side down, to crisp it up? Or does it matter. If I were using chicken thighs, yes, I would start skin side down. 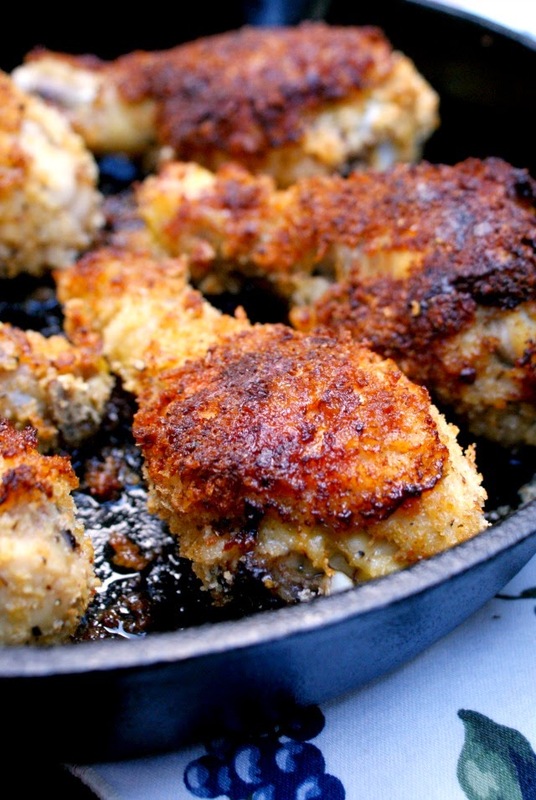 Best chicken recipe ever - my five year old and two year old agree! Thank you so much for adding a family favorite to our table!! Wow! Yay for happy kiddos! I tried this recipe and it came out wrong. I put in a regular baking pan. The chicken legs came out not quite done. I baked at 450 and left them in for an hour after turning them over at 30 min. What did I do wrong? I'm not sure why it would have come out this way for you. I have always used cast iron for this recipe, so maybe a regular baking pan was the issue? I just made this. This is lovely. Made some slight changes (added more pepper, seasoned the raw chicken, etc). I had this with some sweet potato fries and it was amazing. I love the sweet potato fries pairing. Great idea! Wonderful! So happy to hear your son likes it! I've made this 3 times now and love it! It's so easy and delicious, thanks! This is smelling great. Got it in the oven now so I can reheat for dinner later. I used the glass. I also did half crushed potato chips and half bread crumbs cause I did not have panko. I had ten drumsticks so I upped the seasonings a twitch. Can't wait to taste this! I love the crushed chips idea. I hope they came out great! Oh, man...I sure don't! I should have totally written a post for them by now! All I do is toss fresh green beans with olive oil, season with salt and pepper, then roast in a 425 degree oven for 20 minutes, flipping halfway through the cook time. I hope you love them! It would really depend on the size of your skillet and the size of your drumsticks. Just try to keep a little space between each piece of chicken so that they're not touching. I hope it turns out good for you! Giving this a try tonight ... smells delicious! The chicken was a hit ... my 'picky' husband loves it! I made a bunch so we would have left overs. I will definitely make this again and again. Thanks for the great recipe! I have not tried preparing it the night before. I imagine that the coating might get too soggy to crisp up properly if prepared ahead of time. Oh man I just read all the comments about overcrowding!!! I'm 15 minutes in to the baking. I don't have another cast iron skillet so I grabbed my neglected pampered chef stone dish. Melted butter in it and put 3 on it. 4 in my skillet and nobody is touching. I have to say they are crisping up nicely! Has anyone, tried making these without the Parmesan cheese? I have not made it without the parmesan cheese, but you can omit it if that's your preference. This recipe is amazing!! I did not know you didn't brown them in the skillet and actually bake them in it. I ended up browning mine and then put in a glass pan and it still came out delicious and the most moist chicken legs I have ever had! Thank you for this recipe Becky! Do you put aluminum foil in the glass dish? I do not use aluminum foil. Love this recipe. It has become one of my go-to dinners. I remove the skin from the chicken and only use the egg white. Absolutely love it! Thank you! Absolutely love this recipe. I want to make it in bulk for a party and wondered how it reheats. I'd love to make it the day before I serve it and heat it for my party. Anyone like the way it reheats?